Posted on September 24, 2014 by Mandy	in Find of the Week and tagged Collectible, DC Comics, Fashion, Find, Finds, FyndIt, Superhero, Superman, Telephone Booth, Watch. 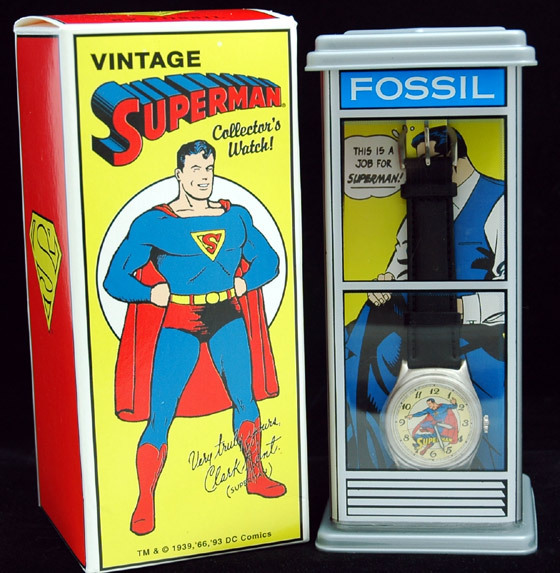 The Find of the Week is a special edition vintage Fossil Superman watch with telephone booth bank. Produced in 1993, this second edition to the Superman collection, depicts comic art from the golden era of America’s #1 superhero. Captured in mid-flight, Superman adorns the face of the watch. It comes packaged in a miniature telephone booth, an appropriate changing spot for Clark Kent. FyndIt member mikestang99 has posted the 1993 rare vintage Fossil Superman watch with telephone to the site as a Find. If you are a Superman collector or in the market for a handsome watch, don’t miss out on this opportunity to find out where to get it. As most collectors know, this watch only comes up for sale from time to time and there are currently none available for sale on eBay. Click here to get your own collectible Superman timepiece complete with telephone booth. Do you know where to find cool stuff for sale on the internet, at the flea market or in the corner of an old antiques store? If so, post it to FyndIt as a Find and you could earn money connecting collectors with rare items. Browse the types of Finds that have been posted to FyndIt and see if you can add anything that would be of interest to someone else. So interesting that they would be willing to pay you money to find out where to get it. Posted on December 22, 2013 by Mandy	in Fashion and tagged Clothing, Coat, Dio de los Muertos, Fashion, Finder, Jewlery, Moncler, Personal Shopper, Rings, Shopping, Sweater, Urban Outfitters, Wanter, www.fyndit.com. FyndIt is a new service that helps people find stuff. It brings people who want stuff together with the people who know where to find it online or in stores. There are members on FyndIt called Wanters who need help tracking down particular articles of clothing. They are willing to pay money to the person who finds the item they are looking for within the specified price and time frame. If you are a saavy fashionista who knows where to shop for all of the latest trends and vintage clothing, you could earn money by helping other people locate apparel online and in stores. Check out the Wants on FyndIt for clothing and accessories wanted by our members. Search for the items online or in a store. When you locate an item grab a snapshot and post a reply Find for the Wanter to review. If your item is a good match, the Wanter will pay you the pre-set bounty reward in exchange for the item’s location. Put your fierce fashion finding skills to work and earn a pocketful of money for shopping sprees! To find out what types of fashion items people are looking for at FyndIt, check out the women’s fashion category. See if you can track down any of the items listed and earn a little extra spending money while you are at it. Here are a couple of fashion items listed by Wanters on FyndIt. Sold out Urban Outfitters Sparkle & Fade lace-back sweatshirt in a size large or extra large. The member is offering a bounty of $5.00 to the person who can locate one of these hard-to-find sweatshirts. A beautiful size one Moncler coat to battle the frosty winter chill. The Wanter is willing to pay a $5.00 bounty to the Finder who can provide a match for the coat shown in the picture. 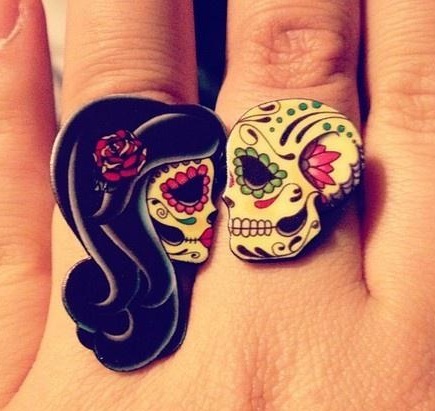 Matching His and Hers Dios de los Muertos rings with a bounty of $5.00.